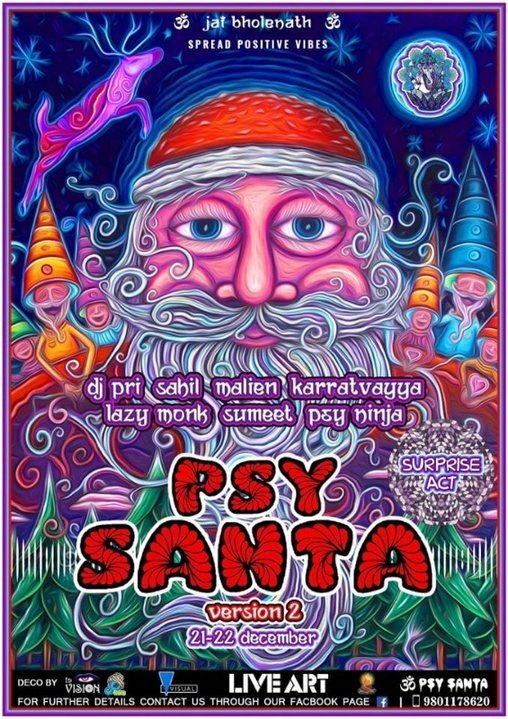 Celebrating Christmas "Psy Santa" is back for its Second Edition After a successful Gathering last year. This year too, we Would Like you to join us To beautiful River side Resort, for mind blowing sunset 2-3 hrs Bus ride,from Kathmandu. Nature Edition with mind altering sounds Goa trance til Modern Trance sounds. Performing Music And Art performances for you, We also have Surprise Live Band this year to Perform live Instruments,Synthesizers, Drums, Guitars, Along with Our Dj`s who going to make you dance all night till the sun come up. "If any one is Interested to put Market Please contact here"
NOTE:- ITS UNDERGROUND MUSIC UNIT GATHERING, WE ARE TRYING OUR BEST TO KEEP OUR MUSIC N ART CULTURE ALIVE FOR ACTIVE MEDITATION AND DANCE.